Our popular day excursions include visits to famous locations including historic cities, stately homes, country parks, shopping trips and the theatre. Details and dates will be published below as and when they become available. We recommend that you bookmark this page and come back regularly to see what we have on offer. Yorkshire tour to include the scenic villages/towns of Askrigg, Aysgarth & Leyburn. We will be visiting the town of Hawes, where free time is available for you to explore this market town or visit the award-winning Wensleydale Creamery, featured on the BBC. Join us for a beautiful tour of the Cotswolds, with gentle hillsides, outstanding countryside, river valleys, water meadows, limestone villages and historic market towns. The Cotswolds is one of the most unspoiled regions of England, a delightful area, where you cannot help but fall in love with its beauty. The ultimate Christmas musical experience with Christmas songs, carols, dazzling dancers, beautiful costumes, outstanding music and singing from a cast of over 100. A fast-moving celebration of the festive season featuring an eclectic mix of both seasonal and year-round favourites, with famous and much-loved chart toppers being performed alongside traditional carols. 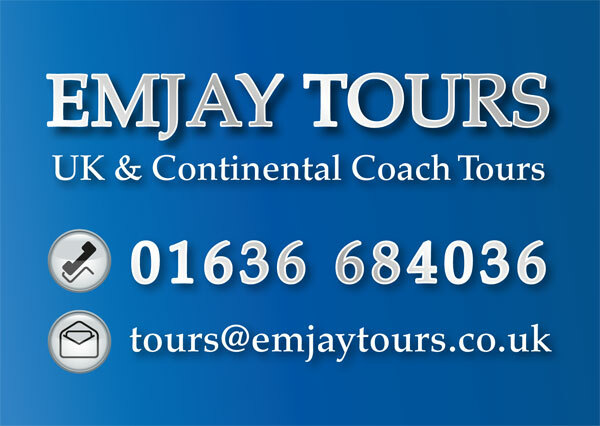 Copyright Emjay Tours, all rights reserved.